The world was once round. This is no longer believed today, because everyone knows very well, that it is only a myth. Our home is floating through space on stone islands, from which water drifts into vacuum. Along with us, there are countless other islands. They all float as they were created. By the hands of the gods! 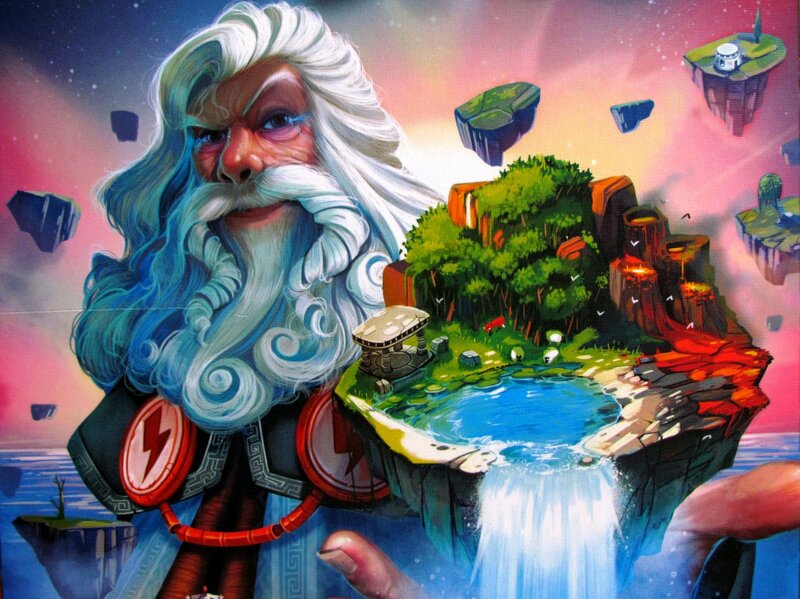 Board world of Orbis is full of such floating worlds. It was precisely such a theme, that favored designer Tim Armstrong, who was behind the game from inception to final version. Davide Tosello took care of its final appearance. The game comes under the auspices of JD Éditions and Space Cowboys. Distribution is handled by Esdevium Games. On the lid of a medium-sized box, we see a waterfall floating from one of the islands, but above all one of the bearded ancient gods. These two elements are also the cornerstone of the content. Several cardboard sheets contain a large number of hexagonal tiles. 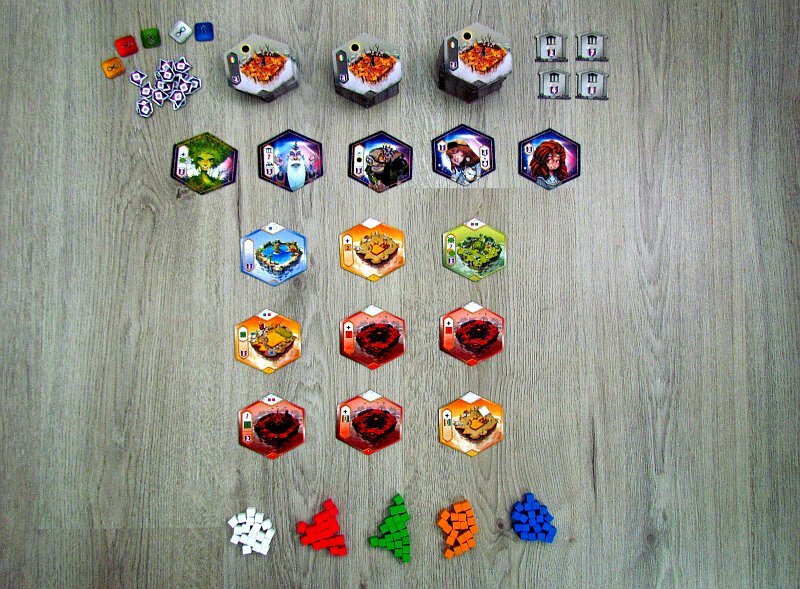 Most specifically 65 pieces, that represent regions divided into three levels increasing in their development. 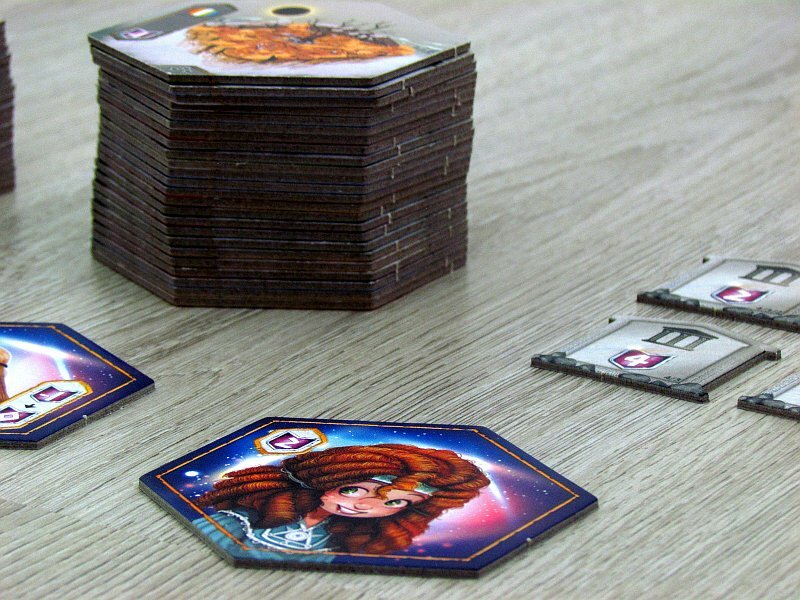 Depending on the number of stars on the back, players prepare them into three piles on the table. 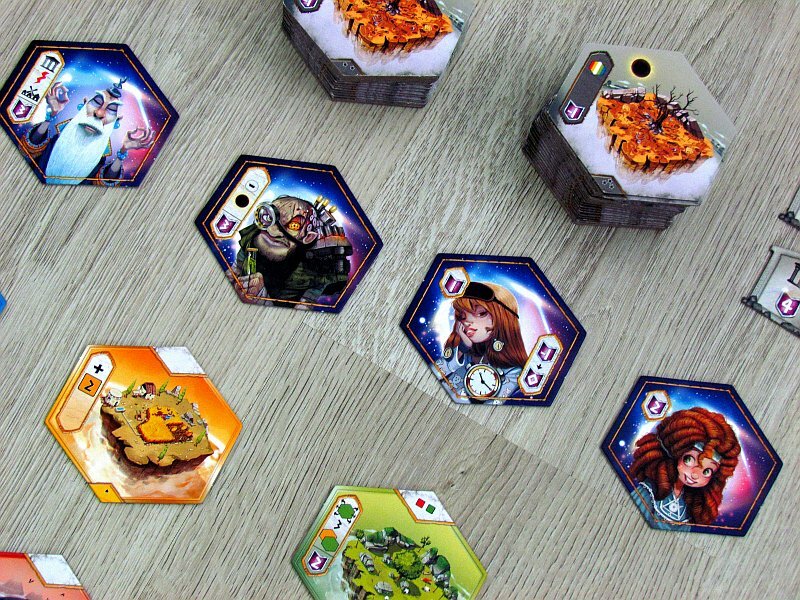 Top nine islands from the one-star deck are then spread out and create a map three times three tiles. But not all pieces offer islands. The same dimensions also have dozens of other pictures, that offer portraits of gods. 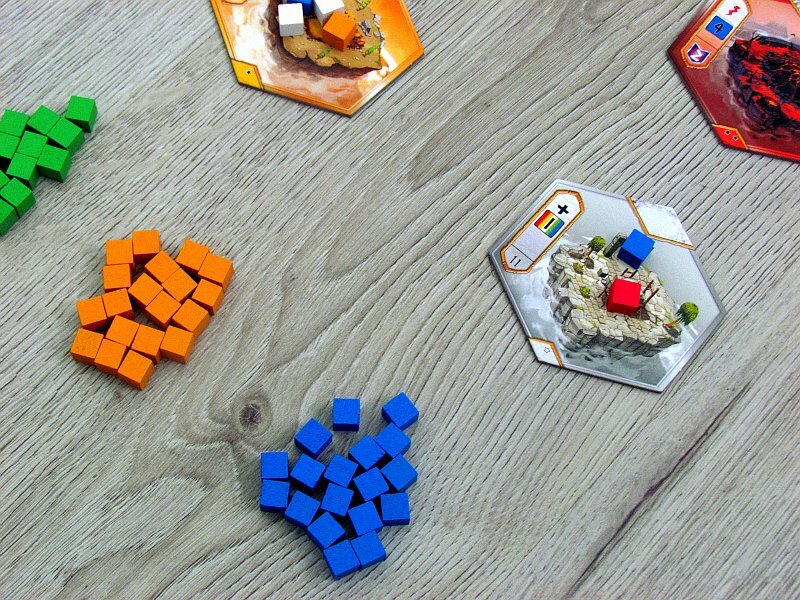 From the shuffled menu, players will reveal several top tiles (three to five), that will be the only one used in the current game and will spread them visibly into line. The joint offer is then finised with the pieces of temples and cubes of believers. The whole match consists of fifteen rounds, in which it gradually creates a pyramid of fourteen hexagonal plates. 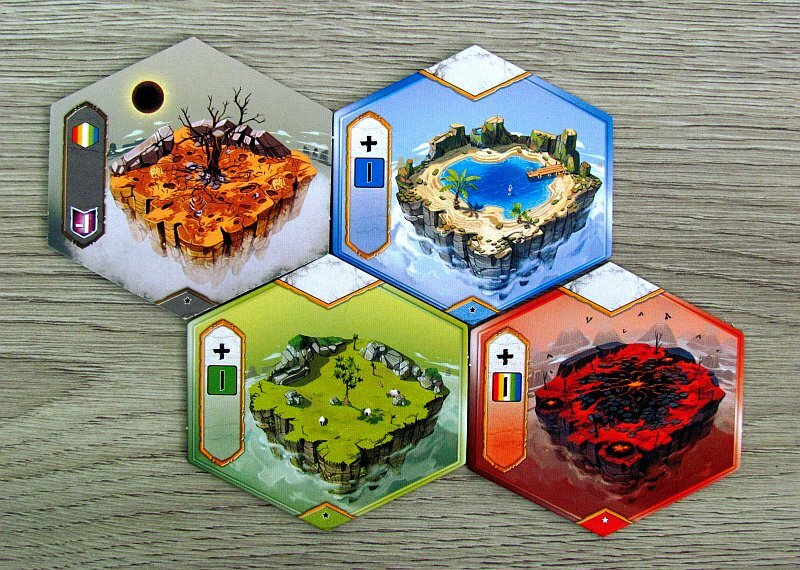 In each of these rounds, the player can choose one of the nine islands offered (even if there are any cubes of worshipers lying there) and buy them. Some of the introductory sites do not have the price and players just take them and then, just like usual, place them in front of them. However, there are other responsibilities. As the island disappears from the offer, it will raise the interest of believers, who appear one at each of the adjacent plates. 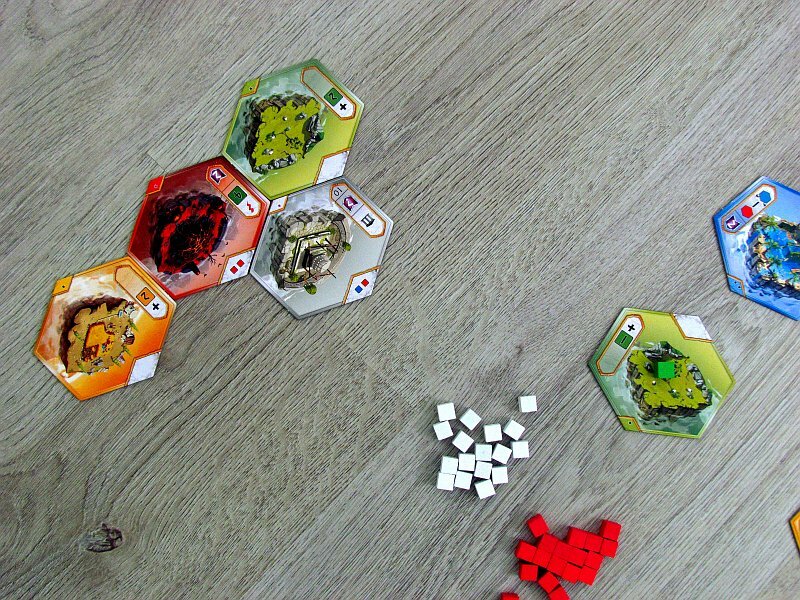 The placed cubes of the believers must be the same color as tile chosen. Then player completes the offer by revealing one new tile from stack with the lowest number of stars and next player is in turn. But back to the building. The bottom line of the pyramid (in the game called the universe) must have exactly five divisions, the next floor needs four, then three, and two on top. 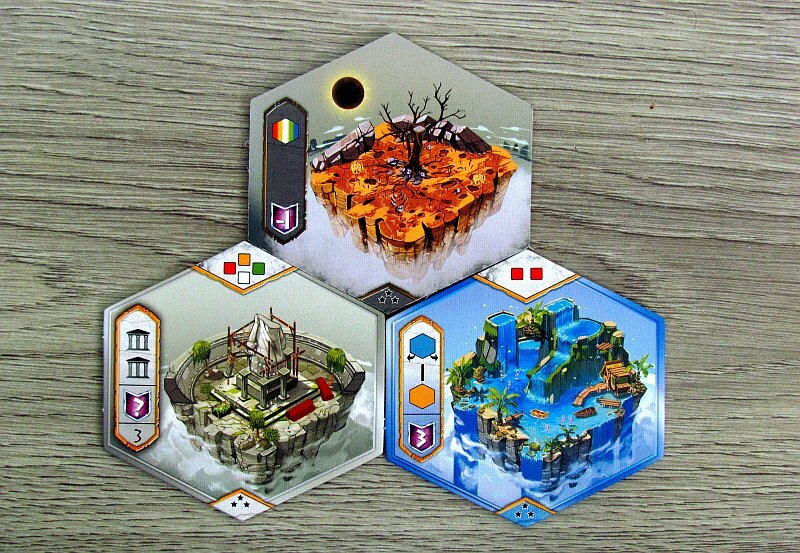 Players always have to start with the one in the bottom, but already with two islands in the bottom row, he player can now place one tile on top. But when building higher floors, tile must have same color as one of its basic stones. In addition, some floating islands can bring benefits to their owners, such as multiple points or a payout exception for newly purchased items. Instead of everything, player can choose from the range of available deities, but may do so only once in whole game. God is placed in front of him and focuses his point tactics for the rest of the game. 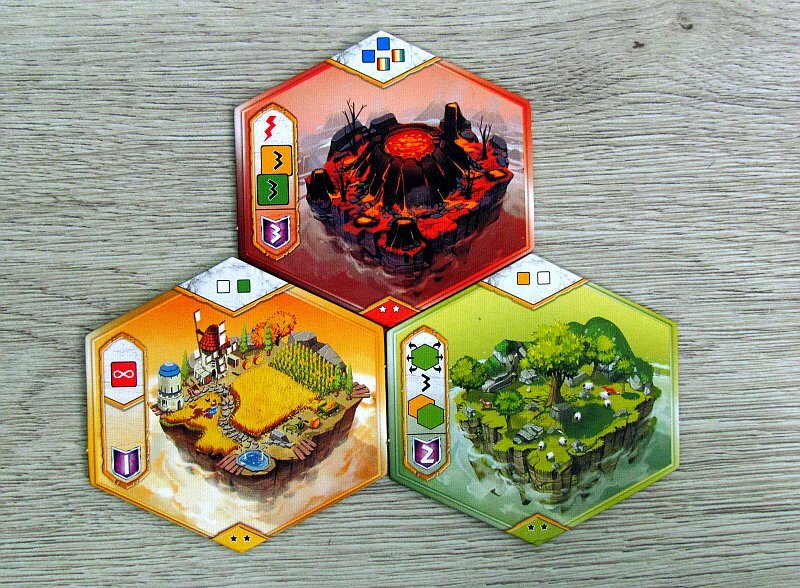 All of this continues across fifteen rounds, in which players get fourteen islands and one god. Depending on the number of island icons owned by the individual participants,, temple tiles are evaluated to give the point basis along with the conditions of the chosen god. To this, everyone adds additional points of creation for the effects of individual locations. The one, who scores the most points, becomes the winner. Orbis is an interesting chase for points. Players must adhere to a few basic building conditions, but above all, they try to make up the universe according to their best abilities. Final scoring is only one. But tile selection is not easy at all. Only the colors and capabilities of the individual parts in the offer are not included. 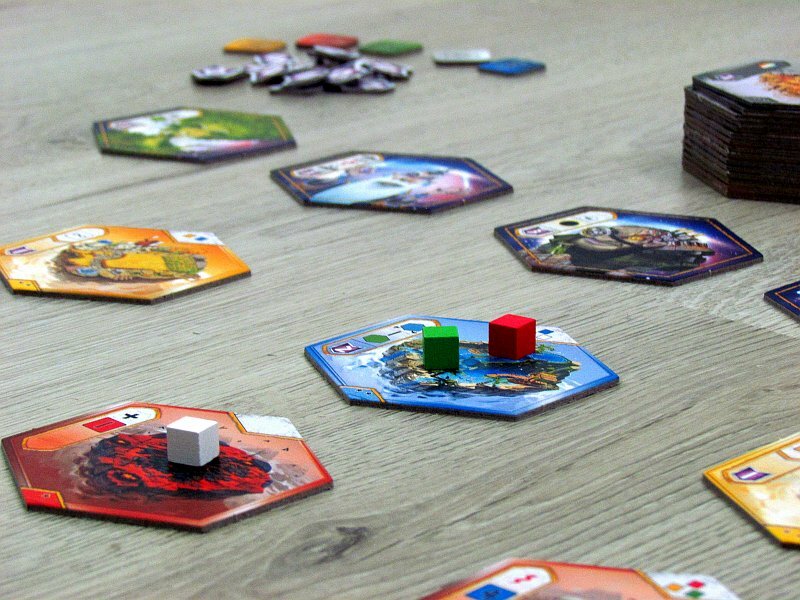 It also includes the cubes of believers, that the player gets with them and needs them to buy the other, more powerful, islands. What is also important is the timing of the moment, when you take one god instead of tile and honor his ideas. If you do it too early, you can have better choice, but you do not know exactly, which of the conditions in the offer you are best able to meet. But if you wait too long, the selection becomes thinner. It is such a fight of patience among all participants. 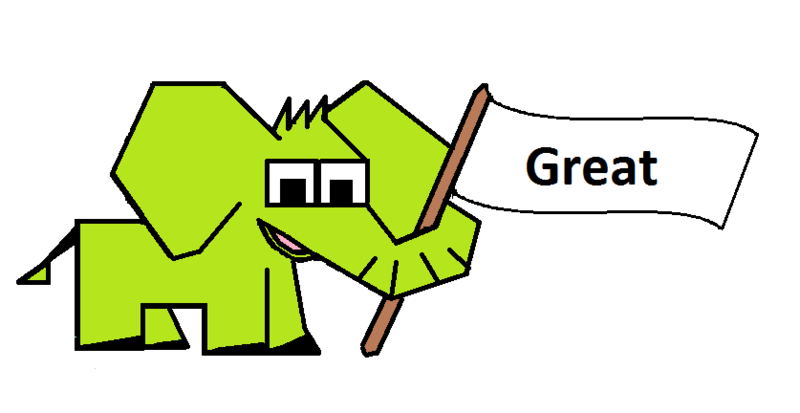 In addition to the variety of special abilities of tiles and gods, the game is really simple. Unfortunately, there is a overview card missing, where all regions would be described with their effects. Like this, players need to browse the rules unnecessarily. 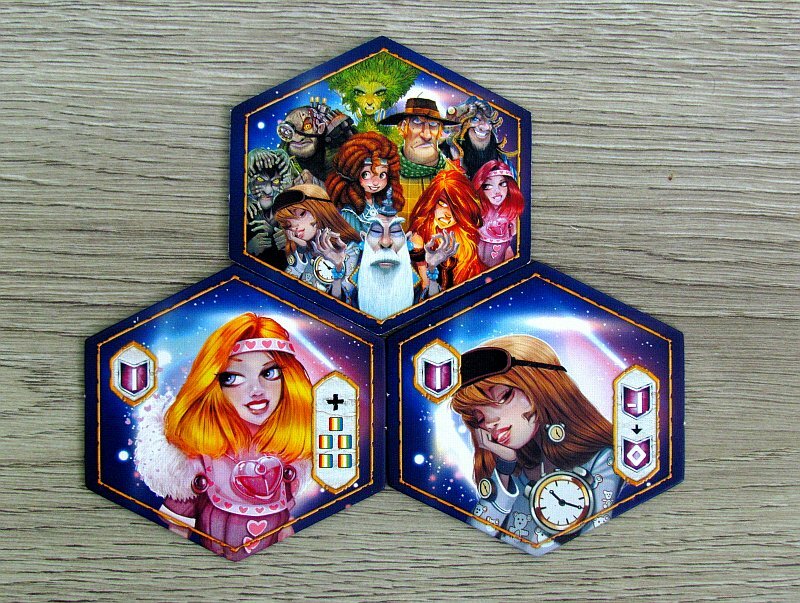 With the gods, it does not matter so much, because you can read their skills at the beginning of the game, but the pieces appear in the game all the time. The offer in the middle of the table is always sufficient, so players can never complain of any extreme misfortune. From the point of view of variability, everything is also quite sufficient, because there are no more, than five of the ten available gods in the game. The whole experience, of course, depends on the number of players taking part. The number of rounds does not change, so it’s clear, that the match itself is stretching. Individual turns will take some time because of the manipulation with cubes. 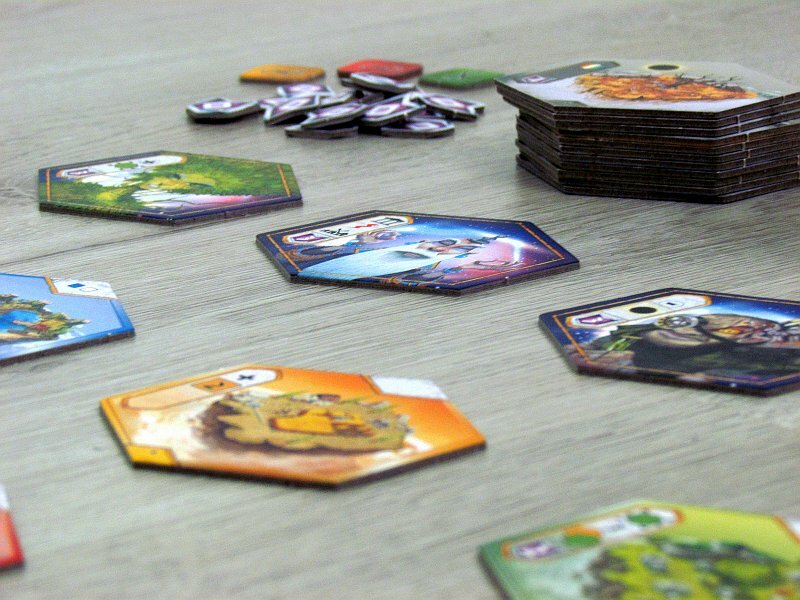 For the four player game, you should count with one hour of playtime. In two, the time is approaching 45 minutes. With lower number, tiles are disappearing more slowly and it is possible to better plan across the rounds. The undisputable weapon of this novelty is the beautiful cartoon graphics. Iindividual tiles are really detailed, beautiful and together they really create a world, that is a pleasure to look at. 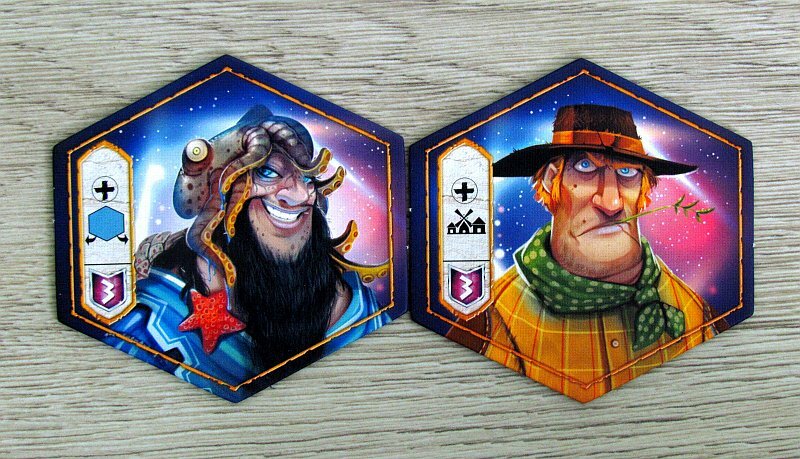 And here are still the portraits of the gods, that move the fabulous feeling of the game even further. On the other hand, the game itself is certainly not fairy tale, because players have to think about this game. 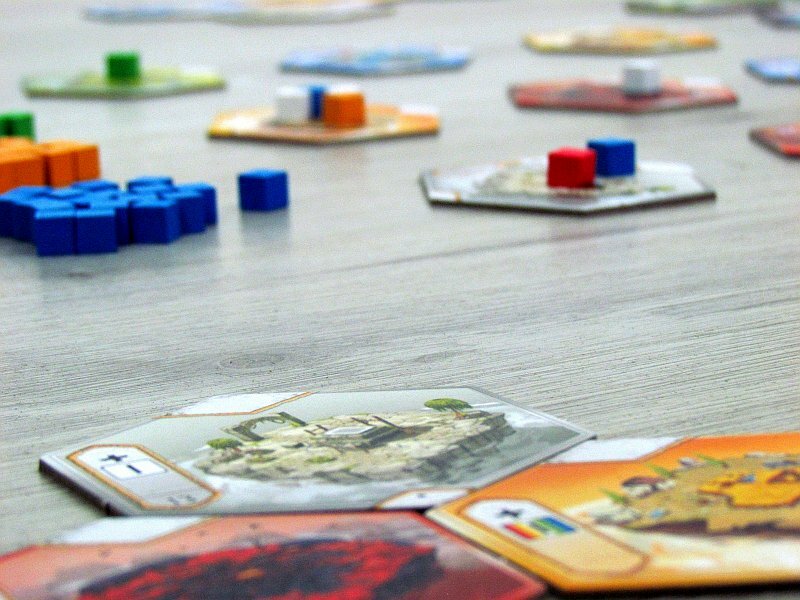 Orbis is a bit more complicated, but it’s still fun for beginners. It does not offer cards, but instead focuses on beautiful tiles. It offers a very pleasant course with a feeling comparable to Splendor. 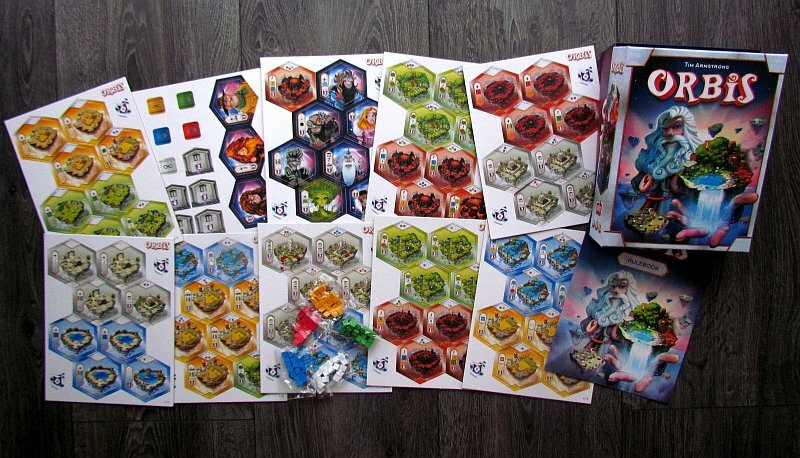 Eventually, Orbis is a bit behind this competition due to its complexity, but it is still very good entertainment and will definitely not get lost among entry games. 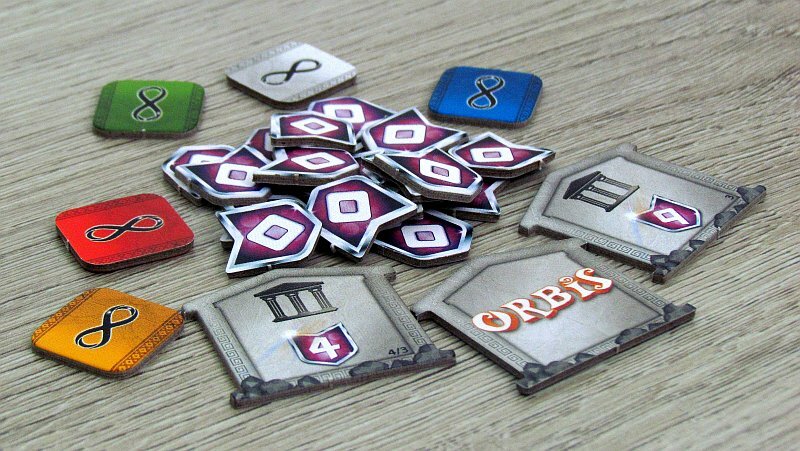 Orbis is a game, that again attacks throne of board games for beginners. He will sit on it, but it also will not be too far from it. This is because it looks not only nice, but also plays very good. Matches are variable and remain solid fast. 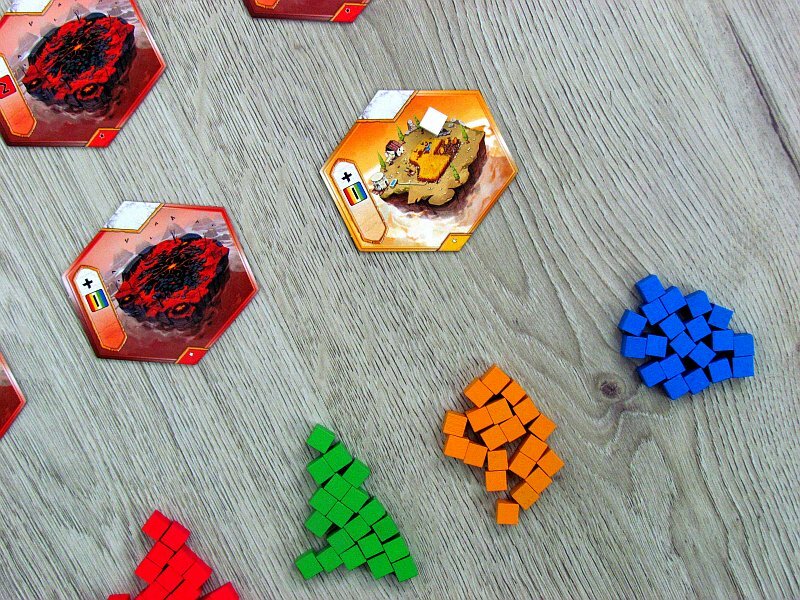 Players have a difficult task in picking tile at each turn, because they are trying to balance a number of needs. 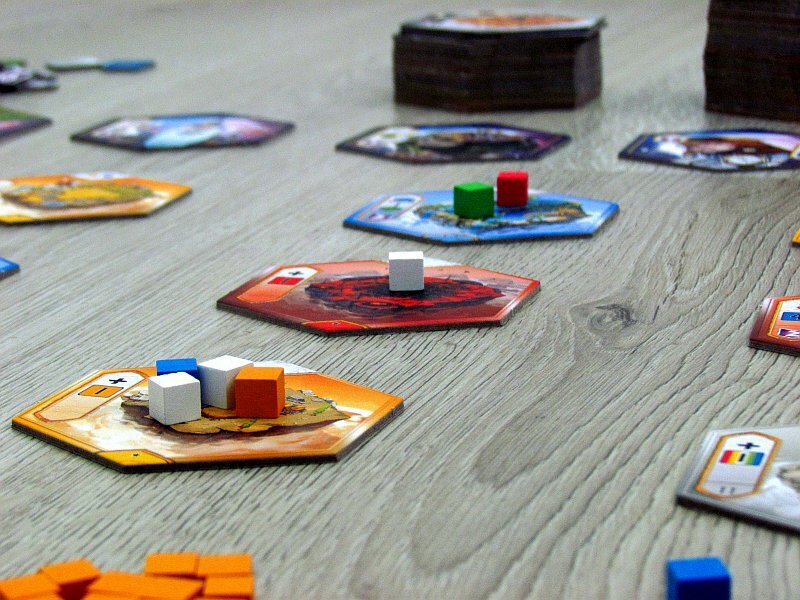 Although, besides simple principles, the game also has a number of special skills, making it a little more complicated to keep track of additional rules, and ultimately works best for beginners. 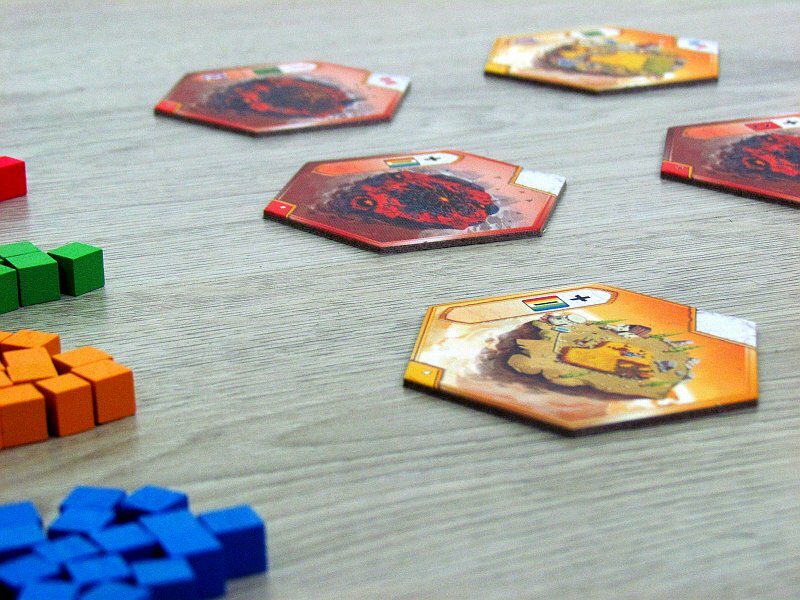 Orbis is really a nice scoring game.